The list below (in no particular order) IMO are must-sees when coming to Busan. If time is limited and you can only choose a couple of these, I would definitely recommend visiting Nampondong (which has great street-food at Gwangbokdong Food Street, shopping for everyone and is the #1 tourist spot in Busan). Jagalchi Fish Market is located right next to Nampondong and is the best Fish Market in Korea ( in my opinion 🙂 ). I guess after that, it really depends what your interests are, in that if you like shopping, Seomyeon and Shinsegae would be for you. On the other hand if you like temples, Haedong Yonggungsa Temple & Beomeosa Temple are places you will want to see. For nightlife and/or restaurants, Haeundae Beach & Gwangalli Beach / Diamond Bridge have you covered as well as the Kyungsung University area ( I met my girlfriend here 🙂 ) which has 2 universities close by so normally has an influx of students at night. The most famous beach in Korea and is great to visit at all times of the day. There is also a coastal walk here as well which allows you to walk around the coast via wooden walkways which lead past the APEC summit building which is worth a quick 15 minute look. The walk loops around so you will come back to where you started. Haeundae also has 1 main street which has some street food including hand-made dumpling (Mandu). There is plenty of restaurants and bars here as well if you are keen to hang around at night and kick on. One of my favourite places in Korea (I enjoy looking at and eating seafood so I’m slightly biased on this place) and it happens to be located next to Nampo-dong which is perfect as I will normally visit both on the same day because of their close proximity. I think Jagalchi is quite underrated as it has a lot to offer and has quite a diverse array of seafood on offer. I even prefer it over the famous Tsukiji Fish Market in Tokyo. 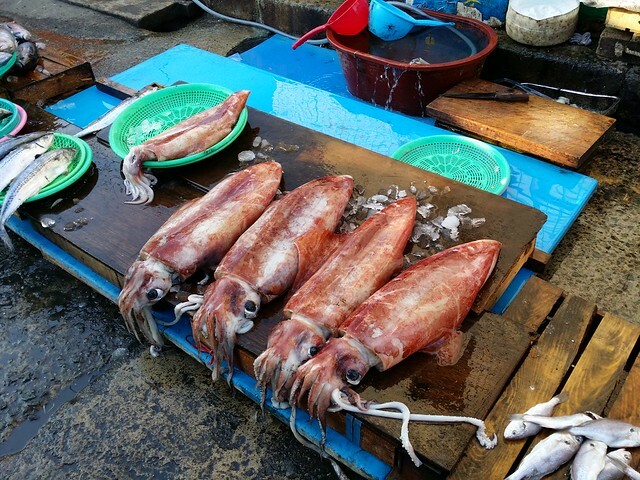 You can see large squid, stingrays, octopus, slate (one of koreas smelliest foods), eels, hagfish + heaps more! This place is famous for its street food and you’ll tend to see a lot more foreigners here than any other place in Busan. There is shopping for every kind of budget and generally has a vibrant feel. I would recommend it as a must-see place in Busan. This is by far one of the best coastal walks I’ve done in Korea and provides a great big breath of fresh air. There is a small old-school train which loops around the area which makes it easier for those unable or not willing to walk the whole way (i think all up its about 3 kms). There is a nice look-out half way around and on a clear day I am told you can see some Japanese islands. Gamcheon is a unique place which reminds me of the favelas in Brazil. There is a load of arty stuff here including numerous amount of paintings/graffiti all over this small village/town which makes a walk-through great. There are people who actually live there so please keep that in mind when you go there. I think it closes around 5 or 6pm so make sure you give yourself plenty of time to look around. Its been labelled the largest Department Store in the world and contains not only 2 large shopping centres but also Busan’s largest Spa ( Jjim Jil Bang 찜질방 ), a movie theater and an ice rink. Shopping here is probably the best in Busan as you have all the high-end brands as well as shops catering for smaller budgets. When coming to Seomyeon make sure you take the subway as you can exit right into the heart of Korean fashion and that is by walking through the endless amounts of underground shops which stock mainly teens/womens clothing of the latest styles. Once you have walked/shopped end to end down there, you can finally arise onto the main area where there are a great selection of restaurants to eat and drink until the early morning. If you’re looking for a night out, here is a pretty good place to start. For those that like a more tranquil place, Beomeosa has got you covered. Great, clean grounds which have a peaceful feeling and overlook the mountains nearby. There is a bus-stop right at the entrance so this place is easily accessibly by public transport (I did and it was very easy). Gwangalli is one of my favourites spots to eat and drink as the Bridge provides such a good backdrop and is always lit up at night. Gwangalli also gives you the option to go choose your seafood at the markets close by and then bring it to a small tented restaurant where they will cut it up and serve it. Again, this place has lots of bars/places to eat along the main road looking over the beach/bridge. Would highly recommend a visit here (if time is short, night time is perfect for drinks etc). Probably my favourite temple in Busan of which I visited many times ( more so because its a nice quiet place – even though a new Lotte Outlet Mall has opened up about 5 mins drive away – great palce for shopping btw 🙂 ). The second time I went was during the Cherry Blossoms season so it was even more beautiful than before. There is also a great restaurant just down the road from this place (on the corner – name is in the blogpost – which is famous for Jja jjang myeon / Jjampong / Tang Suk Yuk) which is worth checking out if you do visit this temple. I absolutely loved this crab market because it not only sold delicious crab, it was fairly quiet, had a load of different seafood on offer, shop people were incredibly friendly and it just a an all-round good vibe about it. Its in the same vicinity as Haedong Yonggungsa Temple, so may be possible to do both in a day if you hire a car. This Coastal Walk surprised me to be honest. This place was suggested by my partners father and it was well worth my time. Very relaxing, great views and if you have the time to walk to the end I believe there is a see-through platform at the end overlooking the water (next time I’m in Korea I will do this walk again until the end). Lotte Mall Dongbusan branch is Asia’s largest premium outlet mall, the multi-shopping complex Lotte Mall Dong Busan Branch opened up on December 23, 2014. I recently visited this mall and was pretty impressed with the shops, food options and general layout of the mall. Parking was super easy and for those wanting to come by bus, there is a stop just across the road. If we have only 2 full days in Busan, what itinerary will you recommend so that we can see the best of Busan. By the way, we will be heading there during the Busan Fireworks Festival 2015. Hi Charlene, I would recommend heading over to Jagalchi Fish Market mid-morning and after that simply walk over to Nampo-dong to do some shopping, eat street food and have a look around. After spending a couple of hours here, I would then visit Shinsegae Department Store (Shopping there is fantastic). After this I would then recommend heading to Gwangalli(Nice view of the bridge) which has loads of restaurants/cafes/bars for dinner/drinks. Second day I would probably start by heading to Haeundae Beach and do the coastal walk (dongbaek Island) and then to Haeundae Market (if you go to my post on Haeundae you can see some pics on this). 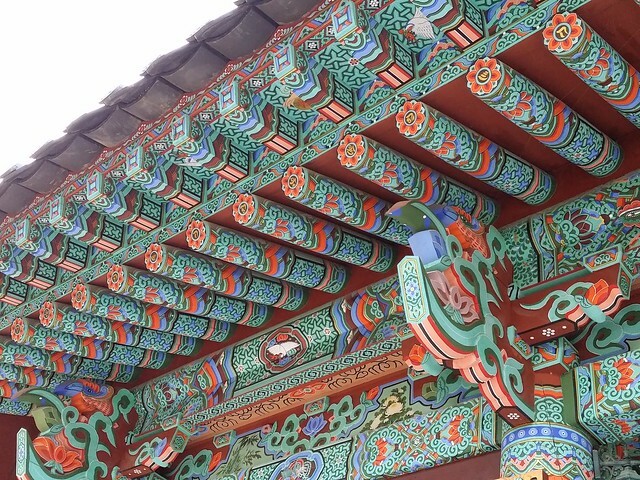 After this I would recommend taking a trip out to Haedong Yonggunsa Temple if you can (there is also a new Lotte Outlet shopping Mall close by which opened up a couple of months ago) or if your pressed for time, I would go to Taejongdae and do the coastal walk there (one of my favourite places in Busan btw). If you do go to Taejongdae, there are some great clam tents which are worth eating at. Then at night I would go into Seomyeon to enjoy the large amounts of restaurants and experience the busiest night spot in Busan. Thanks, I’m glad you enjoyed it. An additional note, the area around Kyungsung University is great for restaurants/bars etc especially on the weekend as its packed with uni students. You take really good pictures ^^ They make me miss Korea so much. If I visit Busan again, I will take your advice and buy some seafood to bring to the beach. Thanks so much Chrissie 🙂 Yeah, it’s a great way to eat fresh seafood at Gwangalli. I hope you enjoy your next trip. We did the full coastal walk at Igidae yesterday and it was stunning! More difficult than I expected (there are lots of stairs and hills), so it is harder than you would think for only 5km, but the gorgeous views were so worth it! Our friends here told us to avoid weekends, though (we went on a Fri during the day) because it is super crowded. Oh nice. Did you go to the very end where it has the platform with the view? I am yet to have done that. Next time I am there I definitely plan on doing this (like you said, probably on a weekday haha). Hi,i’m plan to go Busan with my hubby and 2 kids, please recommend which area and hotel to stay? Hi Sally, Generally I would recommend the Seomyeon area as it is conveniently located on subway Line 1 and Line 2. The Angel Hotel and the Uniqstay Hostel and Suite both are well located and well regarded. The Ibis Ambassador Busan and the Best Western UL Hotel are also both good options here. many thanks for the tips. I will be heading to busan on 25th dec, most probably with my parents for 5 days. Are the attractions open on christmas day? 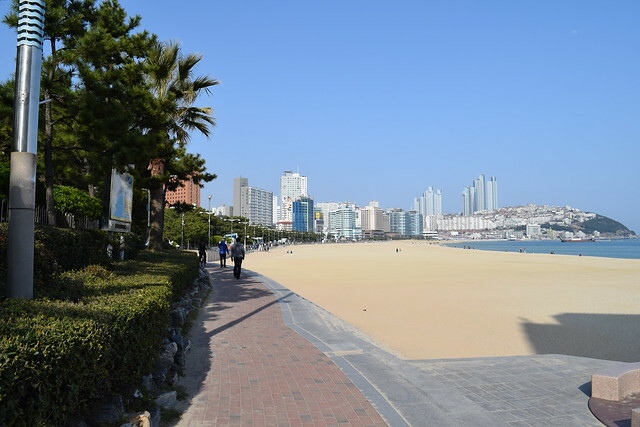 Have you read my post about the best areas to stay in Busan? 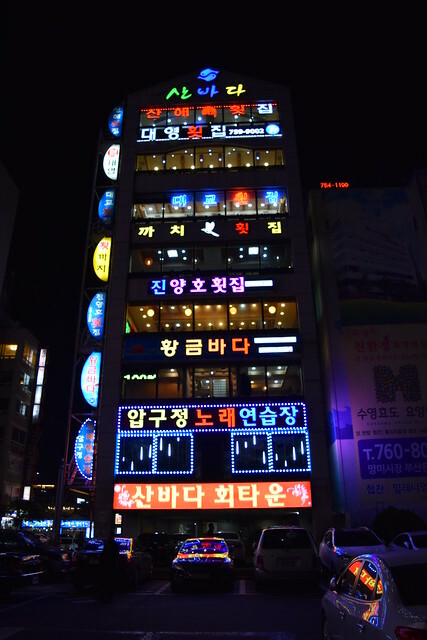 A few of the most popular Hotels are: Hotel Angel & Uniqstay Hostel and Suite in Seomyeon. Sunset Business Hotel & IBIS Budget Ambassador Busan in Haeundae Beach. Guesthouse Mate & Dawn Beach Hotel in Gwangalli Beach. Elysee Motel & Aventree Hotel Busan in Nampo-dong. Hopefully after reading my post and reviewing some of the accommodation I suggested, you should be OK 🙂 Good Luck and let me know how the hotels go 🙂 Happy Travels! what kind of pass to buy ? I would go to the Taxi rank/stand at the airport and they will be able to advise if you can all fit in a maxi cab or whether you will require 2 individual taxis. Airport transfer for a normal taxi is about 20,000 Won depending on traffic. I would recommend this itinerary, as it should keep you busy enough for 4 days. Transport will consist of subways and buses. Keep in mind taxis are cheap in Korea, so if you need to get somewhere quickly or don’t feel like catching public transport, you can get a taxi. I would probably buy single day passes for everyone or you could get a Cash Bee card (you can get it from the airport, subway station or Convenience stores). More Info here and here. I hope you enjoy your trip! I’m going to Busan at the end of March with my wife and 15-month old baby. We like to explore areas which are not typical tourist spots (some is fine), love to checkout the beach but not to hang out there, and we love to eat! This time is a bit different as we have a baby with us. Where would you recommend for us to stay at? We are likely going to use Airbnb for our accommodation. Also, it seems that Seoul is not really baby stroller friendly so I wonder if Busan is the same. Really appreciate your comments! The 10 places I have listed above are definitely worth checking out. If you are looking for something a little different, I would recommend the Dongnae Station area as there are loads of good restaurants there. It’s also worth checking out some of the itineraries I wrote. I would probably stay in Nampo-dong with a child (less crowded than Seomyeon + still close to the main areas etc). 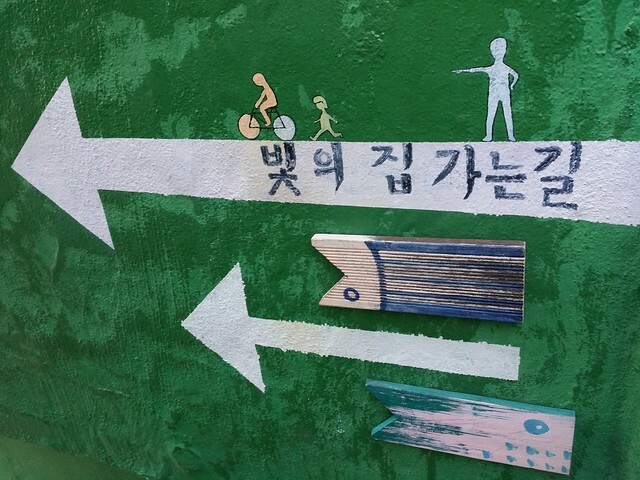 This way you can just make a trip to the beaches (Haeundae & Gwangalli). 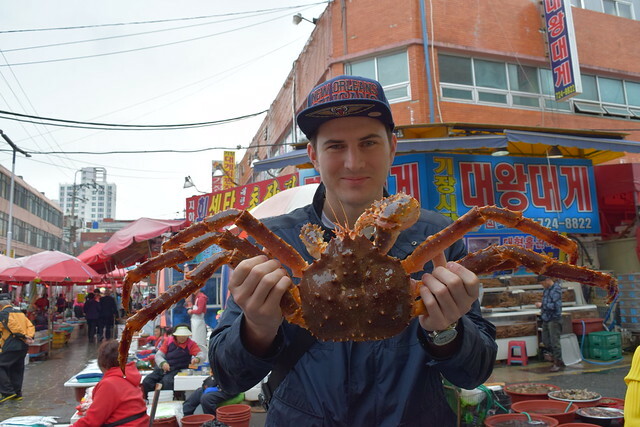 Gijang Crab Market, Lotte Outlet Mall in Gijang & Haedong Yunggungsa Temple is a good day trip. Dalmaji Road is also quite nice and I would recommend it (quite a few coffee shops up on the hill near Haeundae Beach). I think Busan is stroller friendly 🙂 Although I have never taken a stroller there sorry. Appreciate if you can give me my suggestion and please feel free to amend for us. The places you have chosen seem good. My first question would be, which area are you staying in? Some suggestions for each day. Day 1: You might be a little rushed to see all those places properly if you start at 12pm. For example, its an hour by train/bus from Seomyeon (not sure where you are staying). So if you arrive at 1pm. Stay at Haedong Yunggungsa Temple for an hour, its 2 pm. Shop at Lotte Premium outlet mall for an hour, 3pm. Another hour by bus, 4pm. Stay for an hour, 5pm. hour back to Seomyeon (or where ever you are staying) 6pm. Day 2 The places are scattered in all directions. I would recommend looking at a subway map and plan the actual route you want to take. Beomeosa Temple is sought of on its own, however you might want to leave it to last and visit it only if you have enough time. Thank you for your blog. It has been extremely informative as my partner and I are planning a trip to Japan and Korea in December. Not a problem 🙂 In what month are you travelling to Busan? Are you there for New years? Three of us planning to visit Busan on 10-18December 2016. Kindly suggest what are the major highlights we can appreciate the sights of Busan especially with a UNESCO value. I don’t believe Busan has any UNESCO sights (researched from Wikipedia) however major highlights are: Haedong Yunggungsa Temple, Beomeosa Temple, Gamcheon Cultural Village, Gwangalli Bridge, Taejongdae, Jagalchi Fish Market, Oryukdo Skywalk + the rest of the places listed in this post. If you really want to see UNESCO sights, a short trip to Gyeongju would be recommended (Bulguksa Temple / Seokguram Grotto). Hi, me and a friend will be arriving Busan on Sept 15 (2pm) and leaving Seoul on 20th (11pm). How would you recommend splitting up # of days/city? I never been to Busan but I went to Seoul about 20 years ago (lol~) We are not a big beach fan, and we like cultural and historical places/scenery. Shopping is important but I prefer sightseeing more, I was thinking leaving Busan on 18th afternoon but that leaves us less than 2.5 day in Seoul, is this a good split or should I reserve an extra day in Seoul? Thanks! I would spend 2 nights in Busan and 3 nights in Seoul. It is easy to take the train (KTX) up to Seoul (about 3 hours). As to where to stay in Busan, check out my post on Where to Stay in Busan. If you are not too keen on staying near the Beach, Seomyeon or Nampodong would be best. As Seomyeon is extremely convenient in terms of location (as both Subway Line 1 and Line 2 go through here) + only having 2 nights, I would suggest Seomyeon. As you prefer sightseeing, make sure to Haedong Yonggungsa Temple, Taejongdae and Gamcheon Cultural Village. I’m planning to visit Busan by end of Oct (30 Oct-1Nov) for 3 days/2nights stay and have currently booked in The BS Hotel Busan Station. I have also looked up at Uniqstay Hostel and Suite in Seomyeon. You mentioned that staying Seomyeon is more centrally located. We would be carrying big luggage with 4 young kids & 4 adults arriving from Seoul via KTX train. Hence, kindly advise which best itinerary and places to stay that suits us. Nampodong is only 2 stops away from Busan Station while Seomyeon is 6 stops (They are both on Subway Line 1). As Seomyeon is connected to both Subway Line 1 & Line 2, it will make you’re travelling easier while in Busan, so I would suggest staying in Seomyeon. If the luggage is going to be a problem (carrying it to the subway station etc), you could always book a hotel very close to Busan Station. I would suggest staying in Seomyeon as there are a great range of restaurants, shopping and bars at your fingertips as well as not having to change trains on the subways (pretty much all the major sights are on Lines 1 and 2). Itinarery-wise, if you feeling energetic I would recommend this Itinerary, OR if you want to take it easy while travelling in Busan, you could stretch this Itinerary over 3 days. I will be arriving Busan on Sept 19 night (~9 pm) and leaving to Seoul on Sept 21(11.30pm). What would you recommend to do on night Sept 19? We book Aventree Hotel (based on your suggestion ^^) On 20th we planned to buy Busan city tour bus, does this tour can cover all top 10 sights in Busan? And on day 3 we not yet decided what to do, may you suggest any recommend places to cover? However, we are not interested in going to bars. Are you referring to this tour? If so, it covers quite few of the top sights (Gwangalli Bridge/Beach, Haeundae, Shinsegae Dept Store, Taejongdae, Jagalchi etc). It doesn’t cover Haedong Yonggungsa Temple, Beomeosa Temple, Kyungsung University Area, Busan National University Area, Seomyeon, Gamcheon Cultural Village or Oryukdo Skywalk so just keep that in mind. You can cover some of these places on Day 3. I would definitely recommend going to Haedong Yonggungsa Temple during your stay in Busan. Make sure to try Dwaeji Gukbap 돼지국밥 (Pork Rice Soup) as it is a specialty in Busan. 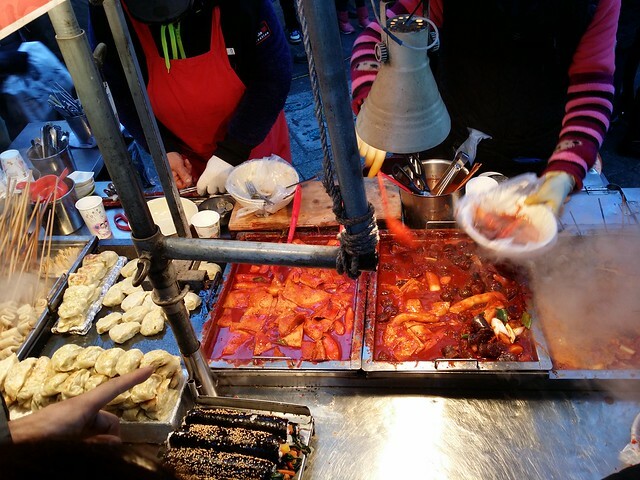 On the first night I would either walk around the Nampodong area and get some dinner and/or try some street food like fish cake (오뎅/어묵), Tteokbokki (떡볶이), Dumplings (만두). If you like seafood you can easily walk over to the Jagalchi Fish market area as there are heaps of seafood restaurants there. Gom Jangeo (꼼장어), is similar to an eel is also popular in Busan (normally served in a stir fry). If not you can always catch the subway to Gwangalli Beach (I was there just 2 nights ago) and enjoy the view of the bridge lit up + all the cafes etc. thanks for the recommendation, but we are Muslim and we do not eat pork but seafood would be nice! No worries Diyana, plenty of non-pork dishes to be had + a load of seafood so you have a lot of eating options. That tour covers quite a few. Just for your reference, places that don’t seem to be included are: Taejongdae, Beomeosa Temple, Kyungsung University Area, Busan National University Area, Seomyeon or Gamcheon Cultural Village. We are going to Busan on March 15 to 18.. U mentioned Seomyeon is a better place to book a hotel.. Is there any place in Busan which my kids , ages 16 and 11 will find interesting? What places can u suggest us to visit? I know it will be cold at that time..so do u advise that we still go to the beach? Location-wise, Seomyeon is great as it sits on Subway line 1 and line 2 making it very convenient to catch public transport. Plus Seomyeon has loads of restaurants, street food and shopping. I would still suggest going to the beach as the view will still be great (probably dont swim as it will be pretty cold). Definitely go to Gwangalli at night (Gwangan Bridge lights up from 8pm – 10pm). For kids, I would suggest Gamcheon Culture Village, Busan Aquarium, Jagalchi Fish Market, Taejongdae and Shinsegae Department Store (ice rink, movie theatre + plenty of shops). 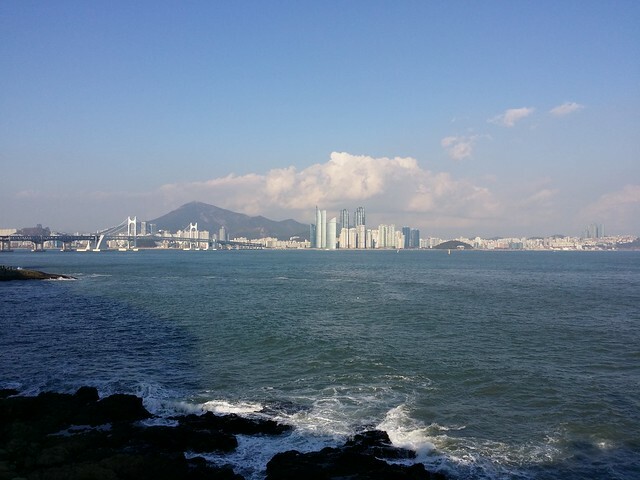 Haeundae Beach + Dongbaek Island walk is also a nice family walking spot. If they like baseball, I would also take them to a baseball practice store (plenty of them around – they are called 야구연습). I usually enjoying hitting for 30 minutes to an hour. Plenty of street food for them to try in Nampodong (right across the road from Jagalchi Fish Market). I will traveling with my buddy to S.Korean from 16 Oct to 24 Oct. Our 1st leg will be at Busan from 16 – 18, 3days 2 Night. Our itinerary, will be closely resemble to your recommend itinerary above. We definitely will be visiting Nampo-dong & Jagalchi Fish Market, Gwangalli & Haeundae, Seomyeon &KSU. 2 of us will be heading out for drinks and dance clubs at night, so which area will you recommend for 2 of us to stay? i am looking at Seomyeon or Gwangalli area but open for better location. I would recommend you stay in Seomyeon (plenty of restaurants, bars and clubs) + Seomyeon is the most central/convenient place in Busan for catching the Subway. Some suggestions for bars to kick off your night: Thursday Party, Fuzzy Navel or The Table. There are loads of drinking spots here so you can keep walking around until you find one that you like. FOXY in Seomyeon is good. The other places I would try are KSU (lots of bars), Gwangalli Beach and Haeundae. Hi! I was reading through your posts, very helpful!! Thanks for all the guide.. I am just wondering, are the bus pick up point hard to locateor how do you know if you should board the bus at which direction or would it be a one way so you won’t get the bus wrong? How do you know which stop to alight as well? Pretty much all buses have the stops in Korean and English (same as the Subway) so you shouldn’t have any problems knowing which stop to get off at. Pretty much most places have wifi so you should be able to plan which bus to catch and google maps should display which side of the road you need to be on. There is normally a sign (bus stand) which tells you what buses stop there. If you are worried you might get confused or go in the wrong direction, I would ask the bus driver if this bus goes to ‘Haeundae” for example (you can show them on your phone in Korean if you like). I plan to be going to Busan for new year’s eve. Where might be a great celebration spot for countdown? Do you think spending 5 days in Busan is too much? I heard that there are hiking and other activities in Busan, but is hiking feasible in winter? 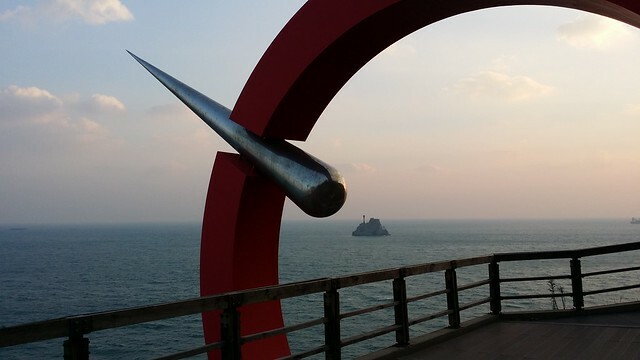 A good celebration spot for New Years would be at Busan Tower (you can see some pictures from my Nampodong post). They will ring a large bell, let off balloons and also have fireworks. If you are going to spend 5 days in Busan, I would recommend a day trip (or spend 1 night there) to Gyeongju (very historical place). It is cold in winter however is doesn’t really rain a whole lot so as long as you are wearing the appropriate clothing I would think it is a good time to go hiking (normally clear skies). For example, you could hike up and see Seokbulsa Temple (which includes a small cable car ride which is nice). wow the Busan Tower looks so nice and lively in Eve! Are there any celebrations by the beaches you know off? Do you know how to get to Gyeongju from busan? A side question, is Naver map more accurate or Google map? or what map do you normally use when you’re in Korea? Google maps is pretty useful. If you have an address in Korean, Naver maps is probably more useful otherwise Google Maps should be adequate. Gyeongju to Busan can be done by bus (about an hour). Departs/Arrives at Nopo Station. Hi. I am going to Busan to Geoje on Nov 18. I would want to visit Busan and then go to Geoje Saturday. The information provided are really great. I will arrive 9pm in Busan, hopin you can guide me how to go to Geoje from Busan? In case, what travelers inn can I stay for the night? I would catch the subway from the airport to Sasang Station (which is right next to the Busan Seobu Bus Terminal). Hotel Paragon is well regarded (Hotel Price | Hotel Reviews). Then you could catch the bus the following day. Thank you for your blog. Very helpful. I am planning a 6 day trip in Busan and wondering if I should rent a car for a few days. You mentioned hiring a car to the temple. Is there a recommended car rental agency? Thank you. They have 2 locations. Haeundae Beach and Gimhae Airport. There are quite a few rental companies so just search around for a price that suits you. Hi again, our trip is just a week away. 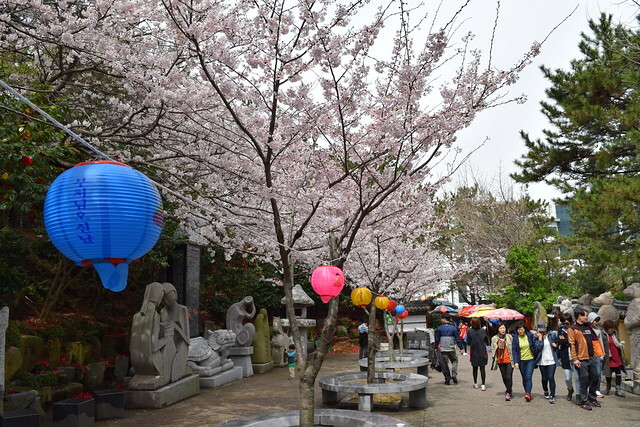 Saw Cherry Blossoms on your photo about Haedong Yonggungsa Temple. Will they still be in bloom when we visit Busan from April 10 to 15? Kindly advise where else we can see the Cherry Blossoms if we are staying in Gwangali. Would like to get some inputs from you as a first time visitor to South Korea, between Jeju Island and Busan – which one will you recommend? I have 3D2N but I heard that Jeju is kinda over-hyped and not many friends been to Busan. Hope to hear from you on the comparison of these 2 venues. Thanks a lot! I am traveling to Seoul in three weeks. Arriving Sunday night and staying until Thursday morning (basically 3 days). Then I plan to take a train to Busan Thursday morning and staying until Saturday morning when I will take the train(s) back to Incheon airport and fly home at 5:30 pm. Traveling by myself and just interested in seeing a variety of interesting places. Assuming I won’t get to Busan until the afternoon of Thursday, I really have about 1.5 days there. Which of the top 10 places do you think I have time to visit and what order? Also, what time do i need to leave Busan in order to be at the airport on time for my flight back to the US? Any help is greatly appreciated. Day 3: Depart Busan Station for Incheon at about 10am. Is Nampodong the same as BIFF square? Is it worth to visit BIFF square? 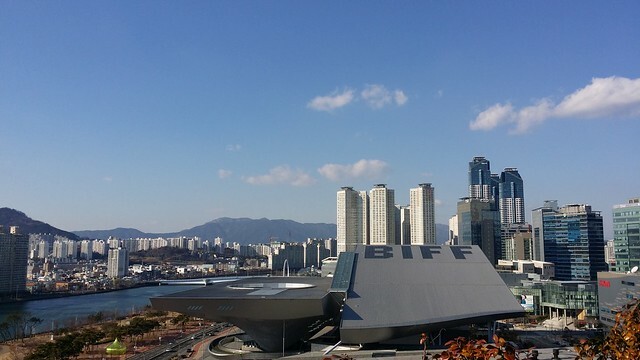 BIFF sqaure is in Nampo-dong. Is you get off at Jagalchi Station at Exit 7, walk straight (1 minute) and turn at your first left you will be at BIFF Square. Nampodong is definitely worth visiting and BIFF square is one of the places in Nampodong you should visit. Places in the Nampodong Area – Gukje Market (Must Visit), Busan Tower, BIFF Square, Jagalchi Fish Market. Other sites that are close – Taejongdae / Songdo Beach Cable Car / Gamcheon Cultural Village. Is that “slate” supposed to be “skate”? If you’re talking about 홍어. Thank you for your Itinery! i will be following it closely. Just wondering if all the places are pram friendly? As I will be travelling with an infant and toddler? Will most places have toilets and change rooms near by? Also is Haeundae beach worth going in winter? Or should I skip and go to Igdae park instead? Hi Lucy, I think most places are generally pram friendly. I always see prams when going to touristy places so you shouldnt have any issues. As for toilets, try to use the ones at the subway stations (they’re regularly cleaned). Some do have changing rooms but not so sure they all do. Haeundae Beach is OK in winter, worth a look if you have time. Igidae Coastal Walk will be difficult with a pram so I wouldn’t advise taling that if you go there.